This page will discuss GE smartdispense dishwashers that aren’t working properly. Some GE profile dishwashers have a smartdispense system. This is a unique dishwasher detergent dispenser, that allows you to pour an entire jug of liquid detergent into the dishwasher at once and it automatically dispenses detergent into the dishwasher in the correct amount with each wash. The amount varies depending on the hardness of your water and how dirty your dishes are. The soil sensor (turbidity sensor) determines how dirty your dishes are. You or your installer must program how hard or soft your water is (see your owners manual). There is a sensor that monitors the amount of detergent left in the reservoir and a low detergent light will come on when it gets low. Note that if you do not wish to use the smart dispenser system you can turn off the low detergent light. On most models pressing the added heat button five times within 3 seconds does this. Do the same to turn it back on. If this doesn’t work or you do not have a button that says added heat, see your owner’s manual. The most common thing that will cause GE smartdispenser dishwashers to fail is that it gets clogged. This is the flaw I see with this system. There is one “official” thing that caused this to happen and one other thing that some of my customers have said caused this. Mixing types (not brand) of detergent in the reservoir will cause the dispenser is clog. Some detergent is made with enzymes and some is made with bleach. If you mix these two types of detergent, the dispenser will clog. Don’t get this confused with brand because detergent companies use enzymes and bleach. You must look at the label on the back of the jug to determine what the detergent is made of. I have seen some of these smart dispensers clogged up and my customers swear that they did not mix the two types of detergent. I have no reason to disbelieve them but GE claims that it will not clog unless the two detergents are mixed. The only thing is that each time this happens the customer had not used the dishwasher in a while. So I believe that letting the dishwasher set for long periods of time without using it will cause the smart dispenser to clog. Note that I have nothing to back that up and GE says it will not cause it. 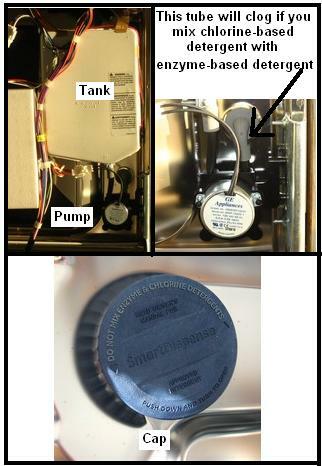 It is not common for the smart dispenser pump motor to go bad on GE smartdispense dishwashers. but you can check the operation of it. The pump motor is activated during each pre-wash cycle for five seconds and during the main wash cycle for an amount of time depending on how dirty the dishes are and the hardness of the water (see opening paragraph). The tube that carries the detergent to the tub is run through the pump. The pump simply squeezes the tube with three rollers forcing the detergent out like a tube of toothpaste. If you suspect detergent isn’t being dispensed, remove the front of the dishwasher and start the cycle. Watch the tube sometime during the pre-wash the pump will activate for five seconds. You will not be able to see the pump rotate but you will see the tube flexing. You can enter the dishwasher into the service mode and turn the pump on manually. Instructions on how to do so should be on the mini manual located under the dishwasher. If the motor doesn’t activate, check ohms across the motor and it should read around 875 ohms. If it is open or way out of range replace it. If it checks ok ohms wise you will have to check for voltage. You should get 120V for five seconds sometime during the pre-wash. If you do not get voltage replace the control board and if you do but the pump motor doesn’t run replace the pump motor. If the pump runs but detergent doesn’t dispense, check to see if the tube is clogged (see section on clogged smart dispenser). When the detergent level gets low on GE smartdispense dishwashers, a low detergent light will come on. There is a detergent level sensor that turns on the light when the detergent gets low. If you fill the tank up and the light stays on the sensor could be bad. Same goes for the opposite if the detergent is empty and the light isn’t on the sensor could be bad. The first thing you should check is the wires. Remove the front of the dishwasher. Once done you should see the tank. The wires should be taped to the side and the top of the tank. If the wires are loose (not taped to the side of the tank) the signal from the sensor could be compromised. This is due to the fact that the signal from the sensor is DC current and can be interfered with by the AC current if ran next to or parallel to AC wires. I wouldn’t think the wires would come loose but check them before you replace any parts unnecessarily. On GE smartdispense dishwashers you do not have to use the smart dispense system so if you do not wish to use the smart dispenser system you can turn off the low detergent light. On most models pressing the added heat button five times within 3 seconds does this. Do the same to turn it back on. IF this doesn’t work or you do not have a button that says added heat see your owner’s manual. I hope this page helps you repair your dishwasher detergent dispenser on GE smartdispense dishwashers.